During talks to renew the 1930 Anglo-Iraqi Treaty, the Iraqi foreign minister, Fāḍil al-Jamālī, stated that the Iraqi people were “sensitive to the merits” of the Treaty. This evening the Independence Party held a secret meeting in its headquarters where they planned a public protest against the government. Students from the al-Karkh and Al Adhamiya secondary schools in Baghdad protested against the statements of al-Jamālī. They marched towards the School of Law with the intention to continuing onto the Royal Palace. When they arrived at the School of Law the police attempted to break up the protest but students from the School of Law left their classrooms to join the protest. The police used clubs and fired shots to disperse the protest and many students were wounded and 39 were arrested (6 members of the Iraqi Communist Party or the related National Liberation Party) and the School of Law was closed. The first episode of the radio serial drama Mrs Dale's Diary is broadcast on the BBC Light Programme today. The serial centres on Mrs Mary Dale, a doctor's wife, husband Jim, and the comings and goings of a middle-class society. The Dales live at Virginia Lodge in the fictional London Metro-land-style suburb of Parkwood Hill. They have moved there from the real area of Kenton, which straddles the border between the London boroughs of Brent and Harrow. Mrs Dale's mother is Mrs Freeman, whom Jim always calls "mother-in-law". The family had one daughter, Gwen, and a son, Bob. Bob, who worked in the motor trade, is married to Jenny; they have twins. Students from all colleges in Baghdad today have joined the strike. The Iraqi authorities have released the arrested students from the School of Law, the student’s strike ceasing soon after. The London Co-operative Society opened Britain's first self-service supermarket in Manor Park, London today. Marks & Spencer have plans to introduce self-service in the food department of their Wood Green store later this month. J1-2 Ringway 1 – Westhorne Avenue section (including the Kidbrooke Interchange with the A20 & M20) of the M2 motorway carrying traffic from London to the Channel Ports. J6-9 Medway Bridge – Stockbury section of the M2. J1-2 Ringway 1 – Eltham and J2-3 Eltham Road sections (including the Kidbrooke Interchange with the M2) of the M20 motorway carrying traffic from London to Folkestone. J5-6 Three Crutches - Medway Bridge section of the M2. J3-5 Mottingham – Sidcup section of the M20. M92 spur motorway for the planned Forth Road Bridge to connect South Dunfermline and the planned M90 motorway to the bridge. It will continue west bypassing Rosyth and to the east it reaches Genrothes and Kirkcaldy. This route will also serve the Fife Ethylene Plant at Mossmorran and various quarries. It will cross the Kincardine Bridge and serve as a Fife to Glasgow route. Westgate - Claypit Lane Phase I of the A58(M) western section of the Leeds Inner Ring Road with a double-deck road structure; eastbound traffic travelling on the top deck. It runs almost entirely in a vertical-sided cutting, up to 20ft deep, with numerous short cut-and-cover tunnels to effectively hide the road and shield its noise. J12-13 The Birches – Verners section of the M1 in Northern Ireland. London North Eastern Railway have begun electrifying the Mayflower Line as work continues on the West Anglia/ Fen Line. 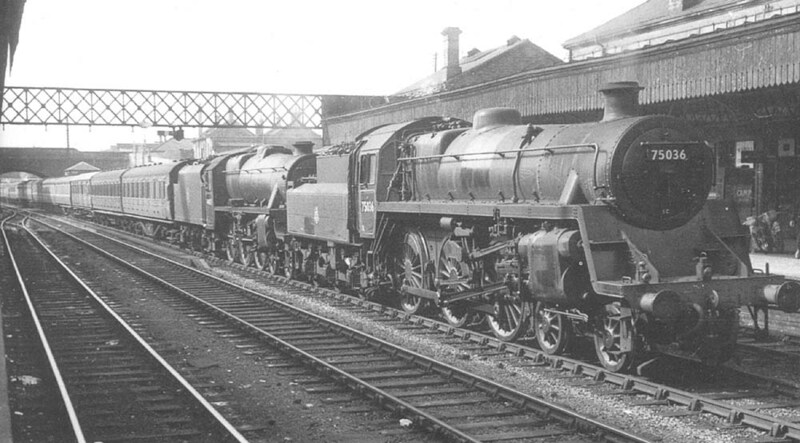 The London Midland & Scottish Railway have begun introducing several new steam engines into its fleet. 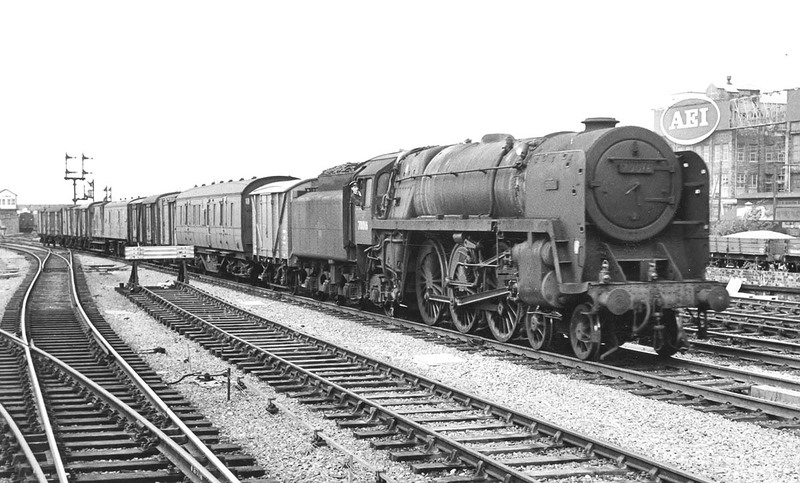 25 LMS Britannia Class 4-6-2 Pacific steam locomotives for mixed traffic duties, 45 LMS Standard Class 4 4-6-0 steam locomotives and 25 LMS Standard Class 4 Tank steam locomotive for commuter traffic will be introduced by 1951. It was announced today that the Iraqi government has signed a renewed Anglo-Iraqi Treaty. In Baghdad a fresh student strike began. Although spontaneous in nature, the protest has drawn the attention and support of the communist Student Cooperation Committee, the Progressive Democrats, the Populists, the Kurdish Democrats and the student wings of the National Democratic Party and the Independence Party. Telford was designated today as Dawley New Town. It is in the borough of Telford and Wrekin in the county of Shropshire about 13 miles east of Shrewsbury and 30 miles west of Birmingham. The New Town area covers 9,100 acres of Dawley, Wenlock, Oakengates, Wellington Rural District and Shifnal Rural District. Development will be overseen by the Dawley New Town Development Corporation, with the first homes planned to be occupied by 1952. Initial planning and design concepts will be produced by the Birmingham-based John Madin Design Group. The Minister of Town and Country Planning has proposed an extension of 12,000 acres taking in the historic area of Ironbridge Gorge at some point in the future. Many of the new town's residents will be from the West Midlands conurbation, which includes Wolverhampton, Birmingham, Dudley and Walsall. In total, half a million square metres of factory space are planned. Telford will be the terminus of the planned M54 motorway linking Telford to the M6. The town will have three railway stations at Wellington, Oakengates and Telford Central on the Shrewsbury to Wolverhampton Line. Today has seen the all-time highest attendance for an English Football League game as 83,260 people watched Manchester United draw with Arsenal at Maine Road. The Glasgow Camlachie by-election was held on 28 January, following the death of the sitting Independent Labour Party (ILP) MP Campbell Stephen, who had held the seat since 1935. However, he resigned the ILP whip in 1947, and later that year joined the Labour Party, for who he had held the seat from 1922 until 1931. The ILP stood Annie Maxton, sister of James Maxton, who before his death had been the party’s most prominent figure. As a seat in a working class area of Glasgow, the Labour Party stood John M. Inglis, a train driver and trade unionist. Given their strong second place in Camlachie in the 1945 general election, the Conservative Party stood Charles McFarlane, a local factory owner. The Unionists stood Charles McFarlane. Despite having no background in the constituency the Scottish National Party (SNP) and Liberal Party also stood candidates. Guy Aldred, a well-known local anarcho-communist stood for his United Socialist Movement on an abstentionist anti-Parliamentary platform. The election was narrowly won by McFarlane for the Unionists. Labour came a close second, while the ILP vote declined dramatically and demonstrated the party was no longer a significant political force. The SNP took a close fourth place, while the Liberals came in sixth, beaten even by Aldred. The Paisley by-election was held on 18 February, caused by the death of former Conservative Prime Minister Stanley Baldwin which had the effect of elevating his son, the sitting Labour MP Oliver Baldwin, Viscount Corvedale, to become Earl Baldwin of Bewdley. The election was fought between Douglas Harold Johnston for Labour and John MacCormick, a Scottish nationalist candidate with the support of the Conservative Party and the Liberal Party, with Johnston emerging the winner by 6,545 votes. The by-election for the constituency of Wigan was held on 4 March 1948, caused by the death of the incumbent Labour MP William Foster. The result was a hold for the Labour Party, with their candidate Ronald Williams, defeating the Conservative candidate Harold Dowling and the Communist Party candidate T. Rowlandson. An independent candidate also stood, ex-RAF airman Owen L. Roberts who fought the election for, “the peace and prosperity of the country”. He came last with just 932 votes. The Armagh by-election was held on 5 March following the death of Ulster Unionist Party Member of Parliament William Allen. Allen had held the seat since its recreation for the 1922 general election. He had often been elected without a contest; the last election at which he had faced an opponent was in 1935, where he had taken 67.6% of the vote against Charles McGleenan, an independent Irish republican candidate. The Ulster Unionists selected James Harden, a former British Army Major. The Northern Ireland Labour Party had never stood in Armagh and decided not to put forward a candidate. McGleenan had been a founder member of the Irish Anti-Partition League and the organisation decided stand James O'Reilly, a farmer and a Nationalist Party member of Kilkeel Rural District Council. Harden won the by-election, taking 59.7% of the votes cast. Geoffrey Bing stated in Parliament that impersonation took place at one polling station on "a really large scale", and that two election agents who arrived to investigate were attacked by a mob of two hundred people. Harden, in response, noted that O'Reilly had agreed with him that, despite some incidents at the close of polling, the election was fair, and that he had seconded his vote of thanks to the returning officer. Harden held the seat without facing a further contest. The Croydon North by-election was held on 11 March. The seat had become vacant when the Conservative MP Henry Willink resigned, having held the seat since a by-election in 1940. The Conservative candidate Fred Harris held the seat for his party with a much increased majority winning 54% of the votes cast. The Brigg by-election was held on 24 March for the constituency of Brigg in Lincolnshire following the resignation of the constituency's Labour Party MP Tom Williamson, a trade union leader who had held the seat since the 1945 general election. The result was a victory for the Labour candidate Lance Mallalieu, who held the seat with a reduced majority, beating the Conservative candidate Anthony Fell. The by-election for the constituency of Southwark Central was held on 29 April, caused by the resignation of the incumbent Labour MP John Hanbury Martin. The result was a hold for the Labour Party, with their candidate Roy Jenkins beating the Conservative candidate J. M. Greenwood. The by-election for the constituency of Glasgow Gorbals was held on 30 September, caused by the appointment as Chair of the National Assistance Board of the incumbent Labour MP George Buchanan. The result was a hold for the Labour Party, with their candidate Alice Cullen. The by-election for the constituency of Stirling and Falkirk was held on 7 October, caused by the death of the incumbent Labour MP Joseph Westwood. The result was a hold for the Labour Party, with their candidate Malcolm MacPherson. The by-election for the constituency of Edmonton was held on 13 November, caused by the death of the incumbent Labour MP Evan Durbin. The result was a hold for the Labour Party, by Austen Albu. The by-election for the constituency of Glasgow Hillhead was held on 25 November, caused by the appointment as a Lords of Appeal in Ordinary of the incumbent Unionist MP James Reid. The result was a hold for the Unionist Party, with their candidate Tam Galbraith defeating Labour candidate T. A. MacNair. Parliamentary elections were held in Iraq on 15 June. The majority of seats (130) were won by independents. The Istiqlal Party won 5 seats, the National Democratic Party 2 seats and the Liberal Party 1 seat. General elections were held in Kenya during May. The seats in the Legislative Council are distributed according to a race-based franchise. Eleven Europeans were elected from single-member constituencies defined as Part A; five Africans (two of which are required to be Muslims) were elected from three Part B constituencies, and one Arab was elected from a single nationwide Part C constituency. Six Africans and seven Europeans were nominated members. The Labour party was established on 23 March 1948 by several trade unionists. General elections were held for the first time on 20 March, when 8 of the 22 seats on the Legislative Council became directly-elected. Voting was not compulsory and a restricted to British subjects, who constituted around 2% of the 940,000 population. Although various organisations called for a boycott of the elections, voter turnout was 63.1%. The Progressive Party (PP) was the only contesting party, winning five of the eight elected seats, the others going to independents. Of the 22 seats in the Legislative Council, eight are elected, two nominated by commercial organisations (the Singapore Chamber of Commerce and the Chinese Chamber of Commerce) and twelve appointed by the British authorities; these included the Governor, Colonial Secretary, Financial Secretary, Attorney-General, Solicitor-General, two Directors, two ex officio Commissioners and four non-officio ones. A by-election was held in the Rural West constituency on 16 October. Independent candidate Balwant Singh Bajaj was elected with 55.5% of the vote, taking his seat on 19 October. Constitutional reforms in 1948 replaced the appointed Advisory Council with a Legislative Assembly. The new Assembly had 75 members, of which 10 were appointed by the Governor-General, 42 elected by electoral colleges in northern provinces, 13 nominated by the provincial councils in the three southern provinces and 10 directly-elected in Khartoum and Omdurman. Parliamentary elections were held on 15 November. The elections were boycotted by pro-Egyptian parties, leaving only the Umma Party and the Independence Front to contest the elections. Demonstrations led to the deaths of 10 deaths and 100 injured. The Umma Party won 26 seats and the Independence Front 4. Most of the remaining 44 members had been elected due to the influence of officials and sheikhs. Voter turnout in the directly-elected seats was only 18%. The newly-elected Legislative Assembly met for the first time on 15 December 1948. The Umma Party's Abdallah Khalil was elected Speaker. A party of journalists and steel industry representatives were shown around the new David Colville & Sons Limited plant being built at Ravenscraig, Scotland since 1944. Today several coke ovens, a by-products plant, a blast furnace and an open hearth melting shop with three steelmaking furnaces are complete and operational with work on-going on the stripmill, which should complete next year. The total cost will be around £20 million with the government contributing some funds towards the cost. The works are now among the most modern in Britain and indeed Western Europe. A large-scale student march in Baghdad today was joined by workers at the Schalchiyyah railway depot and many poor shantytown dwelling migrants from South-Eastern Iraq known as the Shargāwiyyīn. The police responded by firing directly at the demonstrators but they did not disperse and many were killed or injured in the subsequent clashes with police. The Baghdad demonstrations have escalated. Iraqi police fired on students who were retrieving the bodies of those who had been killed yesterday. Members of the faculty at the School of Pharmacy and Medicine resigned from their posts in protest and the protests spread in the streets, including many non-students and Communists. This evening, the King of Iraq declared martial law and the Iraqi Army were called out to break up the demonstrations. Fresh demonstrations have broken out in Baghdad combining students, members of the Independence Party and workers. Scuffles also broke out between members of the Independence party and Communists. The Iraqi delegation returned from London and in a radio address the government called for calm and stated that details of the treaty would soon be provided. Immediately, after the broadcast several hundred people went out onto the streets. This morning the Central Committee of the Communist Party in Baghdad was arrested in a police raid and several thousand copies of inflammatory leaflets ceased. Students and workers gathered to protest and a large group attempted to cross the bridge into West Baghdad where they would meet with students and the Schalchiyyah rail workers. In Al-Rasafa, the police opened fire on a group of Communists, killing four. The Communist protestors turned back as several Independence Party supporters along the route turned on the Communists. On the other side of the river, another clash broke out between Communist and Independence Party protesters. The police and Army moved in to break up the protestors and eventually the demonstrations petered out as the government flooded the radio and press with anti-Communist material. The British government in a press communique by the Foreign Secretary pledged not to interfere in Iraqi internal politics and financial matters beyond British-owned assets. It also pledged to look into reducing the number of troops stationed in the country following the stabilisation of tensions with Persia. Privately, the government has taken steps that if the violence gets out of hand and Iraqi government repression gets too severe, given the hundreds already injured or killed, that G.O.C Eastern, Middle East Command. Lt. Gen R. McCreery can call his men out of their barracks to disarm units of the Police and Iraqi Army. Ernest Bevin fears that the King of Iraq may unleash a harsh repression against his own people and risk a worse outbreak of violence. At the moment all British units are confined to barracks and so far no incidents have been recorded other than some small gatherings and stones thrown about. On the BBC Home Programme, a broadcast this evening of a debate between Bertrand Russell and Frederick Copleston on the existence of God has divided the audience and raised much discussion. The Maudsley Hospital Medical School, founded in 1924, today changed its name to the Institute of Psychiatry, with Aubrey Lewis appointed to the inaugural Chair of Psychiatry. Police in Baghdad raided the premises of the Al-Asas (The Foundation) daily newspaper which had recently been founded by the Iraqi Communist Party. The newspaper was edited by well-known lawyer and communist leader, Sharif ash-Sheikh. The newspaper has now been banned by the government. The Ministry of Supply, the Air Ministry and the War Office today officially endorsed an ambitious new air defence plan for the nation called Operation Rotor. This plan is for the modernisation of entire radio-location network across the British Isles. Operation Rotor will see 28 Chain Home stations, 8 centrimetric stations and 6 Chain Home Extra Low stations modernised with new electronic equipment by late 1949. This will be followed by the construction of 11 underground GCI stations by September 1952 and 14 semi-submerged and above-ground GCI stations by November 1953. Six new underground Sector Operations Centres are planned by September 1953. An associated plan, Operation Vast, will oversee the development and deployment of mobile radio-location systems of equal performance to Rotor types but capable of being transported by a single lorry for units overseas. The completion being planned for July 1954. Ernest Bevin breathed a sigh of relief he flicked over the last page of the latest report from Baghdad. "It seems the bloody trouble has been nipped in the bud. Thank God their King saw sense and took our advice not to go on the rampage. That would have messed up things all round and we would have been in a damn awkward position." His private secretary nodded in agreement. The Secretary then opened another envelope, "Sir, we've received reports from the Admiralty regarding German naval movements in the region." Bevin rolled his eyes as he took the piece of paper, "That's all we need, we'd better send a brief note to our friends in Berlin to explain the situation. No point letting them getting spooked and them blundering in. No doubt the attempted coup in Yemen has shaken things up all round too, I had the Dutch minister on the phone this morning again. People are joining the dots and seeing plots everywhere these days, we don't need to panic just yet." Four powerful cruiser-destroyers, the newest concept in destroyer-type vessels, have today commissioned into the Royal Navy service. HMS Belfast, Gloucester, Edinburgh and Manchester will form the 29th Destroyer Flotilla at Portsmouth. These ships are developments of the ‘Special’ HMS Revolution which pioneered the concept of the big-gun destroyer. The Admiralty has given this new breed of ship classic light cruiser city names to reflect their power and role akin to those of the light cruisers which served the fleet so well during the Great War. The Malaysian Red Crescent Society was founded today. It will work alongside branches of the British Red Cross Society. The Admiralty have disbanded Western Approaches Command. The heavier ships have been transferred to North Atlantic Command and the sloops and coastal minesweepers have been transferred to The Nore and Channel Command. The Commander-in-Chief Western Approaches has taken the opportunity to retire, in his own words “to free the chances for promotion of younger officers.” Admiral Sir Max Kennedy Horton joined the Royal Navy in September 1898, going to HMS Britannia. Whilst serving aboard HMS Duke of Edinburgh, he was involved in the rescue efforts when SS Delhi ran aground off Cape Spartel and was subsequently awarded The Board of Trade Medal for Saving Life at Sea in silver. The outbreak of the Great War saw Lieutenant-Commander Horton in command of one of the first British ocean-going submarines, HMS E9. At dawn on 13 September 1914 he torpedoed the German light cruiser SMS Hela six miles southwest of Heligoland from a range of 600 yards. Although pursued most of the day by German naval forces, E9 managed to reach the safety of Harwich. Entering the port, Horton initiated the tradition of hoisting the Jolly Roger after a successful patrol. Three weeks later Horton sank the German destroyer S 116 off the mouth of the river Ems, subsequently being awarded a Distinguished Service Order. Sent into the Baltic Sea during 1915, Horton sank a number of merchant vessels and damaged the German armoured cruiser SMS Prinz Adalbert. Promoted to Commander, Horton was awarded a bar to his DSO in 1917. During the 1920s, Horton served commanded the cruiser HMS Conquest and the battleship HMS Resolution. Promoted to Rear Admiral in October 1932, he became Commander of the 2nd Battle Squadron in December 1933. In 1935 he took command of the 1st Cruiser Squadron. Promoted to Vice Admiral in 1937 he became Chief of Staff of the Home Fleet. In 1940 he commanded the South Atlantic Station and in 1944 was promoted Admiral and took command of Western Approaches Command, a position he has held since. The Admiralstab notes this development with interest. The Administrative Staff College has begun its first courses at its premises in Greenlands, Henley-on-Thames. It is Britain’s first business school and it hoped that it will help to train a new generation of business and administrative staff to meet the growing needs of industry. De Havilland Chief Test Pilot Group Captain John Cunningham today has set a new world altitude record of 59,446 ft (18,119 m) flying a de Havilland Vampire F.Mk.1 fighter. In related news, the RAF has begun taking deliveries of the new Vampire FB.Mk.IV ground-attack fighter variant with clipped wings, underwing bomb racks and a longer stroke undercarriage. A more powerful Goblin III turbojet is also fitted. 400 are on order and Iraq has 15 export Mk.55 versions on order for delivery later this year. A new radio comedy Take It From Here, written by Frank Muir and Denis Norden, is first broadcast by the BBC today. The show is set in a commercial radio station and contains a segment consisting of parody of film and book styles. The Royal Iraqi Navy today took possession of four ex-Royal Navy destroyers gifted to the nation to modernise its Navy. The four Y Class destroyers (HMS Yeoman, Yonder, Yorker and Yukon) have been fully refitted and are now known as HMRIS Al Ramadan, Al Tami, Al Shaab and Al Adrisi. They have replaced four older torpedo boats previously transferred from Britain. A Conspiracy at the Barley Row? Michael Braithwaite was driving back down from an assignment "up country" in one of the pool's Humber saloons. He'd been travelling all day down the A6 down into the heart of Lancashire. He'd been slightly worried that his old clapped out Humber wouldn't pass muster on the two stretches of motorway that had been built to bypass Lancaster and Preston, part of the new M6 that would replace the tedious A6 as the main route back to the south. It was getting dark as he came off the Preston Bypass and rather than making for the A6 he mistakenly took the A49, the Wigan Road. It took him some time to realise his mistake as the gloom of dusk took hold and a fine drizzle began settling on the windscreen. In fact it wasn't until he hit the outskirts of Warrington that he realised his mistake and that he'd have to stop somewhere overnight anyway. He hoped his allowances would cover at least a modest bed for the night as he didn't fancy sleeping in the car overnight. He saw the board on the roadside for a pub and pulled in. He glanced up as he stiffly got out of the car, the drizzle whirled around him but he could make out the lettering, 'The Barely Mow' above. The warm light of the pub streaming from the windows looked inviting and he stepped in. The bar was fairly crowded and he managed to squeeze in and order a pint and a pork pie and even arranged a night in one of the available rooms upstairs. He settled in a cosy near the back and his ever-trained eye looked over the customers. It wasn't one of those "spit and sawdust" type pubs and gave all the airs of a rural local. The customers were in the main locals, but among them were some well-dressed young men who were well spoken and fond of tweeds. He guessed they may have been teachers from a local school. As he munched on his pork pie he saw a man clearing tables and collecting the empties, a non-descript sort of man who looked at ease doing this sort of work. He caught sight of the man’s face, he recognised him as an old acquaintance. That night lying in bed, he put the pieces together. A fortnight later Michael was summoned to see his section head. Wondering what he’d done now to incur his displeasure, he soon found out it was the result of the background check on Aston. “They would hardly give a reference if they had reason to suspect him,” his section head intervened. Michael wondered what his hunch had gotten him into and how much work it would cause for him, but even so something seemed not quite right and nobody could afford any slip-ups on a project like this. HMS Zeus was just about to turn about and head back for her berth in Scapa Flow following routine exercises when her ASDIC returned an echo. "ASDIC, bridge. Contact bearing red six-oh, range nine hundred yards" the voicepipe trumpeted. Lieutenant Clarke looked at the chart and turned to his Captain in mild astonishment, "Sir, there's nothing marked on the chart, the target sub shouldn't be here." The Captain, a greying-haired old hand bent towards the voicepipe, "Bridge, ASDIC, is it a positive contact? The Sub-Lieutenant in the ASDIC shack below shouted back, "Positive contact, bearing green six-four, moving slowly to port, good contact, possible submarine." "Are you sure?" the Captain asked. "Yes Sir, quite sure, positive contact, even better than the usual target sub. Target speeding up, she's diving." "Very well, put it on loudspeaker," the Captain rose and as he gave instructions to bring Zeus onto an intercepting course the unmistakable "Piiing-Gaaah" echoed on the bridge repeater. "Number Two, get this off to Zebra and Zenith, repeated Scapa Flow and repeated Admiralty, have detected possible unidentified submarine contact four miles south of the main southern channel. Am making Asdic search of the area, request you join us for box search. Add our position to that." The Captain clapped his gloved hands together as he stood by the front railing of the bridge, "Bring the crew to action stations!" Shares in the Mostyn Estates Limited company in North Borneo were not helped in value when the company announced that profitability has still not recovered since sizable investment was made in rubber trees in 1939 with poor results. New equipment acquired with help from the Colonial Development Board in 1945 has not helped and the company has ceased abaca planting and the firm now intends to concentrate on cocoa and hardwood timbers. Four new heavy cruisers today officially joined the Royal Navy. HMS Devonshire, Westmoreland, Shropshire and Essex are all ships of the Northumberland Class and are the second quartet of ships in this class to complete. These ships have formed the new 5th Heavy Cruiser Squadron which is homeported at Cromarty. Flt Lt. Graham Partridge banked his Sunderland over the grey choppy waters of the North Sea. For two days his squadron, 211, and a neighbouring unit 202 at Sullom Voe, had been flying racetrack patterns over the area since the destroyer Zeus had made an ASDIC contact with a suspected foreign submarine. Keeping his eyes out of the cockpit the endless water all looked the same. His wireless op, Flt Sargent Ronnie Clough promised him their ASV set could find something as small as a periscope but he was always doubtful, especially in these sea conditions. In the distance he caught sight of a four-engined aircraft approaching from the south. At first he assumed it was a German reconnaissance plane, but as it came nearer the radio sparked up. "Anchor seven this is Apple four, we've been assigned by Castle to assist in this sector." Graham could see the aircraft was one of the new Avro Shackletons, probably sent up from the Air-Sea Warfare Development Unit at Ballykelly. Glad of another set of eyes and ASV he flicked on his VHF transmit button, "Anchor seven to Apple four, glad to see you. Suggest you take eastern part of sector, we will head west five miles. Watch out for Jerry recon planes, if you see one don't get within five thousand yards, but don't let them crowd you out of the search pattern. Good hunting." Lieutenant Peter Thorne gave one last brief wave at the smiling deckhands and fellow submariners on the deck of the tender Ambrose as their submarine HMS Wolverine manoeuvred away from the side of the tender and headed into the Clyde. He glanced over at his captain, Commander Craddock who was looking out for shipping. He had been skipper of the Wolverine since her commissioning and had an lengthy and illustrious service aboard submarines, at one time being an examiner on the 'Perisher', a course which no officer wishing to command one of His Majesty's submarines could afford to fail. Peter wondered who the two odd chaps who clambered aboard yesterday evening where, the men soon spotted they weren't submariners and with full provisions and fuel tanks and a destination he only knew as the Baltic, he knew this wouldn't be a dull patrol. Craddock of course knew his precise destination and mission, the Flag Officer Submarines, Home Fleet had briefed him personally along with two officers from Naval Intelligence. As his steely eyes scanned the horizon and fixed upon two small puffers heading inbound for port he knew his crew and ship would be ready to fulfil the mission and he hoped everything would go smoothly. Hey Hood, I don't suppose you've watched some of the old informational video shorts the RN did in the 60s? Your recent post reminds me a tad bit of Voyage North from 1970. Edit #2: I presume Wolverine's headed into the Baltic to watch the German coast, correct? If they happen to go much further east than, say, Bornholm, then they might run the risk of encountering Russian naval forces beginning their spring exercises. If they're still in the Baltic in May, they'd run increased risk of encountering some Russian antisubmarine ships working up. I doubt you're going to go that far east, though. No I hadn't seen that, many thanks for the link as it looks very interesting. My inspiration was part WW2 war movie and part the real-world Arctic submarine missions in the late 50s/early 60s, some of which were pretty hairy. Thanks for the correction, I meant Perisher but typed the wrong thing, I've corrected it now. *spoiler alert* Yes, Wolverine is headed into the Baltic, Bruce had PM'd me the other day asking if the RN does what the Germans are doing, covert submarine recon of ports etc. and I felt that the Baltic would suit the submarines very well. Wolverine is relieving another submarine on station (or recently returned to port), I envision a cruise along the Baltic coast taking in the major ports and German exercise areas, Wolverine might go a bit further East than Bornholm if her skipper thinks the Jerries are hiding something further east. I suspect they will be out of the area by May so I don't think they will run into your exercise. He only goes where the action is! Glad you enjoyed it. The guy who posted the video has a bunch of other RN videos from different periods, some back to the 1940s; but I think some of the best are these 1970s era shorts, such as Fearless to the Fleet, Dragon Squadron, Voyage North, and one that follows a Leander-class frigate (I can't remember the name off the top of my head). Definitely some very interesting cinematography. If you haven't seen them before, I recommend them. Okiedokie. Sounds like the odds of any overlapping zones of operation shall be rather minimal, then. The Russian Baltic Fleet tends to stage their relatively few Q1 exercises east and south of Gotland, mostly to try to keep clear of winter ice. Bornholm's about the furthest west you're likely to randomly encounter them.